Douglas fir is possibly the finest softwood grown in the UK – a magnificent tree when standing and a superb timber once felled. With its reddish-brown heartwood and cream-coloured sapwood, the native Douglas fir grows up to a height of 40 metres with a diameter of up to one metre. Universally recognised for its superior strength to weight ratio, Douglas fir has the highest strength rating of any softwood and is the preferred specie for timber framing in the United States, often being used to construct taller buildings thanks to its excellent performance. Although its strength properties are similar to those of oak, native Douglas fir is 30% lighter in weight and, as a structural timber, offers a cost effective alternative with the price for an equivalent section being approximately half that of green oak. While the large sections of structural timber are generally sourced either from the UK or from mainland Europe, much of the Douglas fir used for joinery comes from the west coast of the United States as it is less knotty than its British counterpart. Vastern Timber specialises in the supply of large section British Douglas fir. Logs are generally cross-cut to 12-metre lengths for transporting to the yard and Vastern Timber can produce beams of up to 9.5 metres in length. 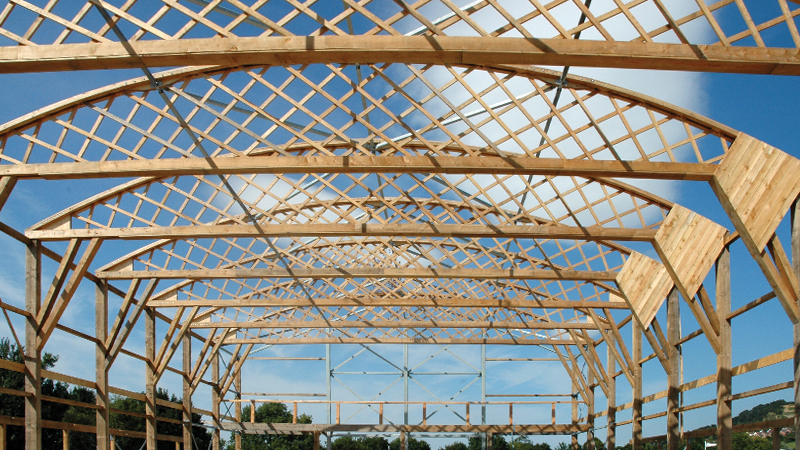 Vastern Timber is not able to offer structural engineering services or advice on section sizes required for particular applications. SS C24 100mm minimum smallest dimension. SS C18 Smallest dimension less than or equal to 100mm. GS C16 100mm minimum smallest dimension. GS C14 Smallest dimension less than or equal to 100mm. Shrinkage Less than 0.5% along the length. Between 5% and 7% across the section. Working properties Generally easy to work when green although knots, especially when loose, can create problems when cutting joints and holes. Knots can become loose as the wood dries out.